To make sure your items fit perfectly when they arrive, we've made some measuring guides with handy tips to help you take accurate measurements first time, However, if you don’t take your body measurements properly, you will find yourself even more confused then before. Leather Baba offers some standard guidelines for finding your perfect fit with their online leather garments. For a leather Jacket typically, this should be from the joint where your shoulder meets your arm to the corresponding joint.Some customizations will tell you to measure from the shoulder blade to the neck, but Leather Baba prefers a full shoulder measurement.To measure the shoulder width Measure from one shoulder edge to the other from the back.These points are where the shoulder meets the arm. to the wrist. For a perfect fit leather jacket let your arm fall naturally (and straight), then measure from the joint where the shoulder meets the arm to joint of your thumb to your hand. Unless the sleeve requires special snaps, buckles, zippers, etc. Leather Baba will normally suggest that you have it shortened at a local seamstress. Any special customization on a jacket normally means that it is not returnable or refundable, so for an easy cuff adjustment it is wise to try the jacket on at home and confirm the perfect fit before deciding if shortening the sleeve is necessary. This is also the most common measurement to inaccurately determine therefore have it done locally and save yourself any disappointment. 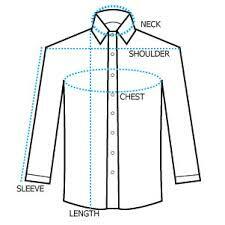 A good local tailor can easily do this adjustment. For a comfortable fitting leather jacket You will want to measure your chest at its widest point which is normally right underneath your arms and across your breastplate. Again you will want to measure at the widest point, which is normally right across the belly button. 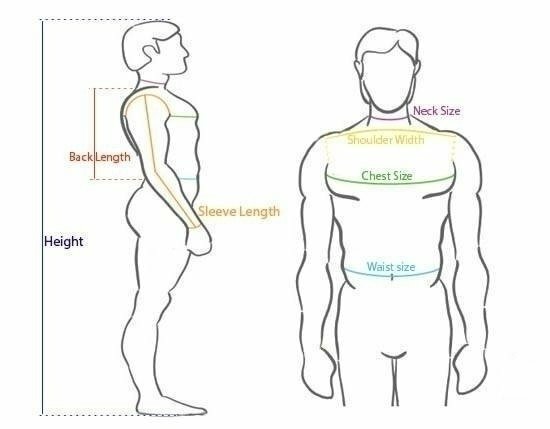 Both of these measurements are vital to a good fit, The chest measurement will allow for a comfortable movement with the arms as well as a good closure with the zip, snaps or buttons on the leather jacket or vest. Since many designs are “fitted” and will hug your figure it safe to say that accurate measurement will make sure that the tummy won’t be sticking out. If you like to wear heavy sweaters or lots of layers underneath your leather clothing, then you should measure yourself fully dressed so that the seamstress can take this extra space into consideration when cutting your new leather garment. On a jacket this refers to the total length of the body of the jacket. Start from the base of the neck to where you want the jacket to hang down your back. However, generally speaking, unless you are having a customised fit jacket instead of one our standard sizes, the jacket length will be made in proportion to the cut and fit of the jacket. Back length is the measurement from the base of center Back Neck Point or cervical to the natural waistline level across belly button. Hips: The widest part of the body below the waist.For the hip measurements look for the widest point on your hips. Waist: The narrowest part of the body, located between the chest and hips.Take measurements right across your belly button. 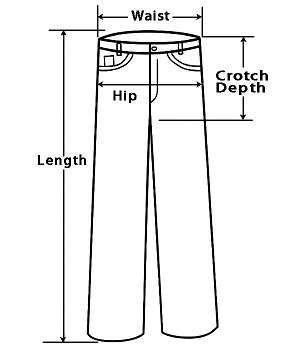 Length Size: Though most times we do not hem the pants, an inseam is needed to be sure that you have the lenght desired.Measurements starting at top of pant waist follow the side pant seam to bottom of pant. Thigh(optional): It helps to have a measurement of the thickest part of your thigh, just to be sure that proportions are suited to you. Take your measuring tape and run it around yourself where you want the top of your kilt to sit. Measure loosely around the widest part of your hip. 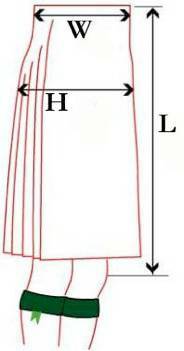 The length of the skirt\kilt should include the waistband. If you are unsure, the hem can be left unfinished and you can have it finished locally. Sometimes you may not be sure which pair of shoes or boots you want to wear the skirt with and it needs a try on first. You will want to measure your chest at its widest point which is normally right underneath your arms and across your breast plate. 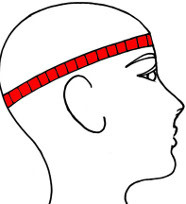 The head measurements should be taken with measuring tape, Wrap the tape around the widest possible circumference - from the most prominent part of the forehead,around to the widest part of the back of the head.Try to find the widest part around the head.